Talking about love lives, its out in the open that NEWS’ member Yamashita Tomohisa has been dating model Seira Kagami for three months. This un-inviting news to Yamapi fans was discovered on 9/15. The girlfriend, Seira Kagami (22) is half Canadian (father) and half Japanese (mother). They’ve been dating for about three months. Neither of them have ever worked together but met earlier this year through a mutual friend. According to some people they’ve been dating since the beginning of summer. Yamapi attended one of Kagami‘s lives in July. Even though he did not stand out too much, people saw the both of the happy together. Kagami apparently also tells some of her most trusted staff members some of their happy times. Well since the guys’ contracts for not having girlfriend’s is probably lifted, and their fans are older now, it’s good to see news like this out in the open. That or it makes for really great publicity on both their parts, which would explain why JE hasn’t done anything about it yet. 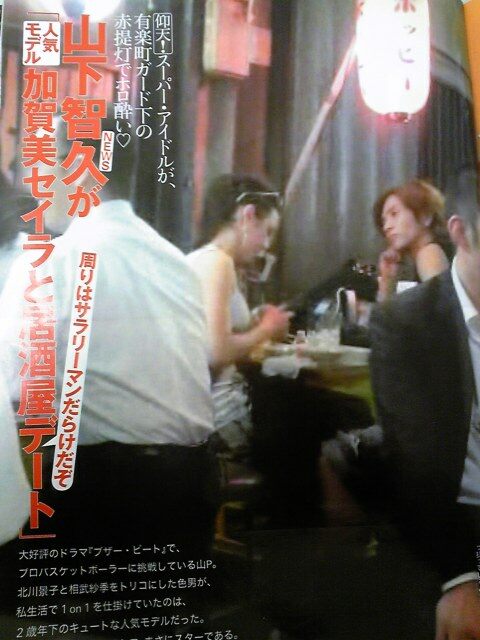 Photo’s from Friday magazine showing “Yamapi” and “Seira”. I say in quotes, because the photo’s are not very clear.